Collinsville's JV team was up 2-0 in the 3rd inning before I left Wednesday. My JV roster is several months old but I'm informed this is freshman Tony Connor (#20) pitching for the young Cardinals July 2nd. The Collinsville Chamber of Commerce provided lunchtime hamburgers and fixings Wednesday July 3rd at City Park for City of Collinsville and Tulsa County workers. Former Collinsville School Superintendent Pat Herald (center above) reads details from a photo shown at (now also former) Superintendent Terry Due's (right above) retirement sendoff June 25, 2014. 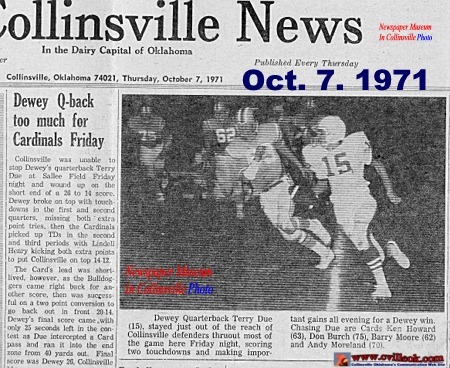 Pat Herald was the 1971 football coach at Collinsville when the winning Dewey Quarterback (Terry Due) left a lasting impression on Collinsville. Due was the first hire (as Collinsville football coach) when Herald became superintendent in 1986. 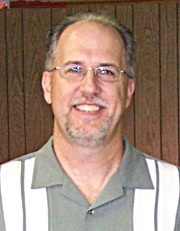 Lance West became Collinsville's School Superintendent July 1, 2014 with Terry Due's retirement. Terry Due will be inducted into the Coaches Hall of Fame July 27th. The previous superintentent transition was in 2010.